Squanch Games and Google represented my project “Dr. Splorchy Presents: Space Heroes” at the Game Developer’s Conference this past week. 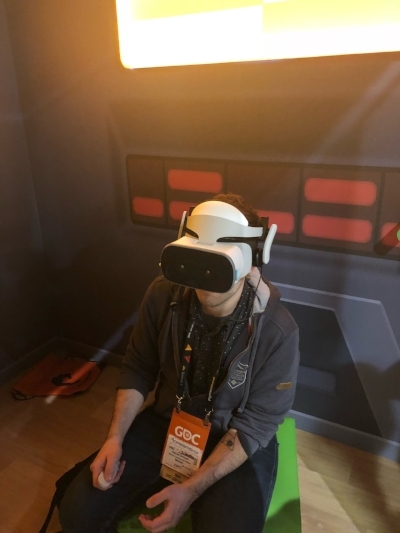 My fans and followers flocked to the Google booth to experience a short demonstration of the game and some even wrote about or made videos of their impressions. Look at this line of future Space Hero recruits waiting to play my exciting demonstration. A brave Space Hero enjoying my demonstration. Road to VR - "Hands-on: ‘Dr. Splorchy’ is Another Justin Roiland™ Fever Dream That Defies a Concise Headline"
Upload VR - "GDC 2018: Dr. Splorchy Presents: Space Heroes Is A Daydream Exclusive From Squanch Games"
The Grid VR - "GDC 2018 - Vive Pro, Silicon Valley, Leap Motion, Dr. Splorchy, Ark Park, Magic Leap"
I will continue to keep my eager readers informed about the latest advancements in the creation of “Dr. Splorchy Presents: Space Heroes” via this blog and my social media accounts.